A flier from a state-based white nationalist organization was found over the summer in this “little free library” in Kingston. A flier from a New Jersey based white nationalist group was found over the summer in a “mini library” in Kingston. The flier, from the NJ European Heritage Association, promoted the idea that there is an insufficient number of “European” babies being born in the United States, according to an email written about the incident by a member of the Joint Citizens Advisory Committee for the Village of Kingston. The email was found among unrelated emails obtained by the Franklin Reporter & Advocate through an Open Public Records Act request. The flier was found on June 18 in a “little free library” on Sycamore Place. 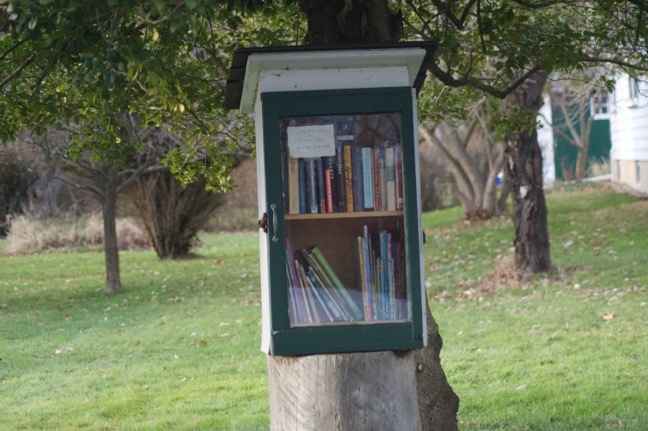 Little Free Libraries – small cabinets usually mounted on poles – contain books that are free for people to take. The owner of the library told police that she erected the library for neighborhood children to use, according to the incident report. The person who found the flier destroyed it, according to the report, which also noted that nothing else was damaged. Fliers from the group have been found in Princeton and other areas around the state, most notably last Spring and Summer. “I think it is very important that we air our grievances civilly and respect everyone’s rights and respect everyone as a fellow human being,” he said.